It could have been yours for a measly $170,000. Arkteia and jordyonbass like this. GliderPoss, mastercutgems, theredspinel and 5 others like this. GliderPoss, theredspinel, missy and 4 others like this. My black opal pendant and my Oregon fire opal. I should take a pic of my ring sometime. theredspinel, MrsKMB, Bluegemz and 3 others like this. Those are beautiful opals! I just love the yellow gold ring setting. Other than locale, what distinguishes Andamooka opal from Coober Peedy opal? I am going to flick this over to a jordan @jordyonbass to answer. I personally have a preference for white body colour in my opals - over black! I just prefer that look. Am I an odd ball? Both locations are known for their white/crystal opal, however Andamooka is known for producing a type of seam opal that has layers and layers of different colours, usually very clean and can also come in very large sizes. While Coober Pedy does get the same layered colour bar formation in it's seam opal, I personally find it's not of the same quality as Andamooka and doesn't usually have as many different colours. There are exceptions to the rule of course but generally that's what I have found with opal from those locations. GliderPoss and theredspinel like this. Thanks for the answer! Lightening Ridge is famous for black opals, right? I don’t think you are an oddball. I love white opals. Correct, it's infamous for it's Black Opal however like other locations it produces all Opal types. Just a lot more Black Opal than other locations! I’m posting here again because I’m smitten. Aren’t these earrings just divine. They are either solid or doublet, I can’t tell due to the setting. I’d say Chaff pattern, maybe slightly towards Jigsaw ? Body tone N1 I’d say and brightness 4, so overall very nice. Lots of red too. GliderPoss, ZestfullyBling, Arkteia and 6 others like this. leslie1956, mastercutgems, theredspinel and 6 others like this. I did try very hard to set it a little differently to many of my other rings but it just wasn't working - after several wax mock-ups we ended back with this design which is very much like my gem silica in my avatar except for bezels instead of claws. I do love it though. It is very hard to capture the colours of the opal but you get the idea. GliderPoss, ilovegemstones, theredspinel and 5 others like this. I dream of setting my opals just like that. Gorgeous!! a very chique and royal setting for your beautiful opal. Thank you. Aren’t they to die for! 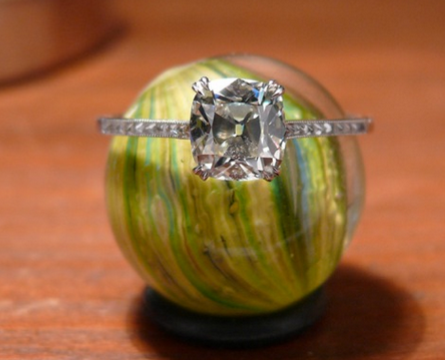 And can you imagine how nice they’d look set just like BlingObssessions stunning ring. I need to win the lottery! My tastes are champagne but my budget s beer! I think you would be very surprised at how reasonable setting costs are here in Dubai. Hence the fact that I can get so many pieces done. I'm on a countdown to try and get everything set as we will most likely be heading back to Australia later this year. My blingobssession will come to a screeching halt as soon as we land on Australia's fair shores. I do love your earrings, Bron and actually really like their existing setting. Aww - thanks Acinom. I wish I could do a better job of capturing how pretty the opal is - tricky little thing to photograph though. Scrolling through all these beauties, it seems opals are easier to photograph than many other gems. Very tempting. Thanks for showing. Ooohh - no, I wouldn't say that. Having had a bunch loose in my hand and then set, I can assure you that nothing in my photographs is anywhere near close to the ethereal play of colour in real life. I find them an absolute nightmare - I just cannot do them justice at all. But then, maybe I'm just a crap photographer hahah! I agree with @BlingObsession . When I received mine the real thing was different from the vendor photo’s... In a good way. No not easier at all. A photo can not capture the play of colors in an opal. Something you can see clear as day may never show up in a photo. It's all about the movement that can never be seen in a photo. Arkteia and BlingObsession like this. Dior Fine Jewelry headed by Creative Director, Victoire de Castellane has the best opal. the way she utilizes them, bring them to life and designs around them - spectacular. True, color movement only on videos, but 'fixed' colors without brilliancy? Yes, and if it has several flashes of color, you also have to hold it in such a position that people would see all. It is at times difficult. Elle! Did you ever set this beauty?